A white lobster that Alex Todd caught north of Chebeague Island. PORTLAND, Maine — The shock of white stood out immediately among the dappled brown and green shells in Alex Todd’s lobster trap. In his decades lobstering in Maine waters, Todd, 48, said he’d never seen anything like the translucent white lobster he pulled up off the north side of Chebeague Island last week. Todd, whose family has been lobstering off the Casco Bay island for generations, marveled at the ghostly catch. He brought it home to show his kids, who operate their own lobster boat, and shared photos with the Maine Coast Fisherman’s Association. 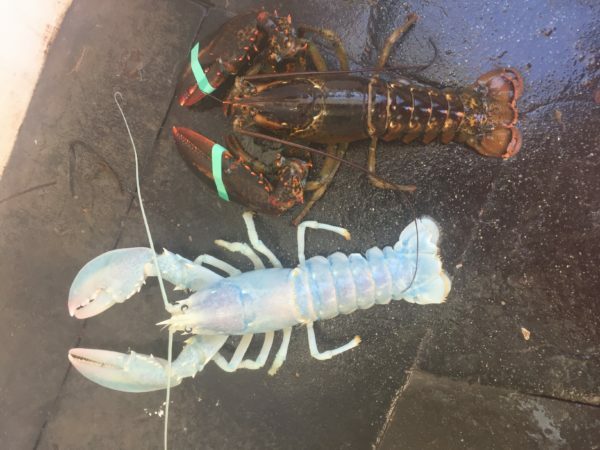 The fisherman’s group, in turn, posted the pictures on Facebook, prompting excited speculation about what caused the odd coloring and what a white lobster would taste like. Albino lobsters, which are totally devoid of pigment and would remain white even when cooked, are vanishingly rare, according to Robert Bayer, the executive director of the University of Maine’s Lobster Institute. But, even without butter, they likely don’t taste any different and the one Todd caught probably wasn’t a true albino anyway, he said. About one in every 10 million live lobsters has a red shell, one in about 30 million has a yellow or calico-spotted shell and other color combinations are even more rare, according to the Lobster Institute. Albino lobster are about one in 100 million. Relatively more common are blue lobsters. They’re about one in 2 million, and Bayer said that this is likely what Todd caught. When blue lobsters molt, their new shells initially appear whitish and only gain the bright blue color over time as the crustaceans pick up pigment from their food, the lobster researcher said. 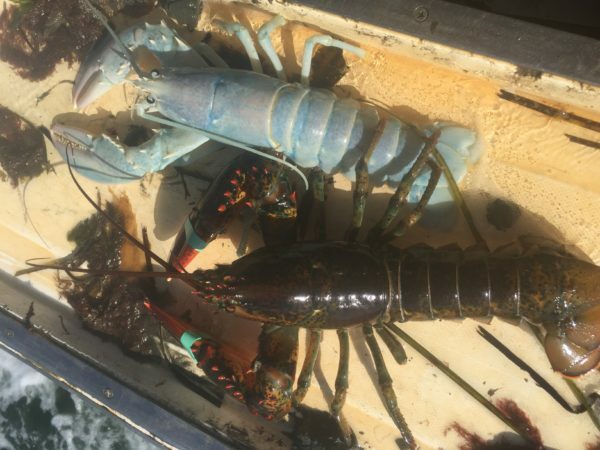 Bayer noted a faint bluish hue in photos of Todd’s catch and said that if the lobsterman had kept it in a tank and fed it, he’d likely have seen the lobster grow a deeper blue. But Todd wasn’t sure. Based on the firmness of its shell, he said it had likely been months since the white lobster molted. And, at this point, a definitive answer can only be found at the bottom of Casco Bay. 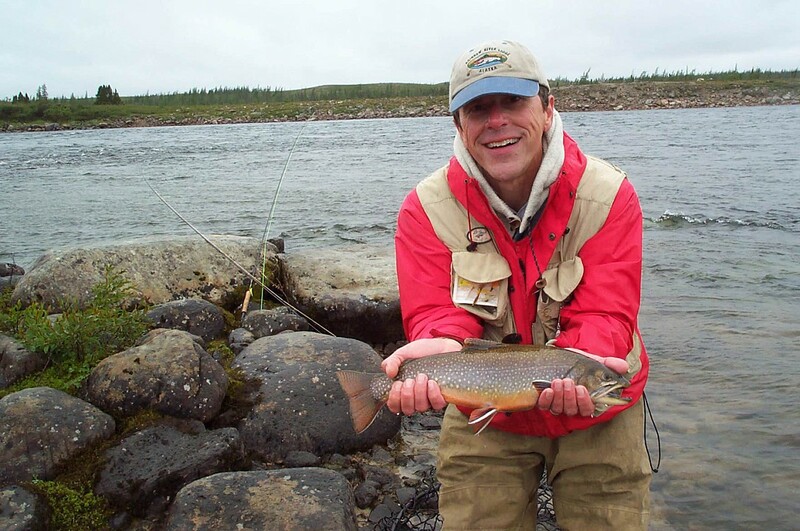 When Todd was examining his pale catch, he noticed a notch cut into one of its flippers. Lobstermen used the V-shaped mark to signal a female that was carrying eggs and should be thrown back. And that’s what Todd said he did. So, whether blue or white, look for more odd colored lobsters off Chebeague Island.